[CONT](VC):When you would call guardians, you can call grade 2 or greater cards from your soul. 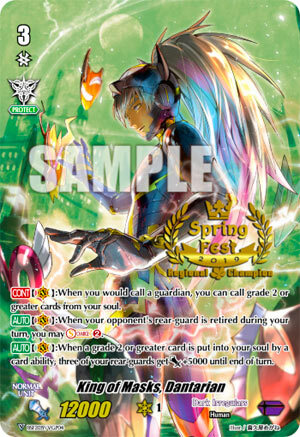 (You can call any number of cards to (GC)) [AUTO](VC):When your opponent’s rear-guard is retired during your turn, you may Soul Charge (2). [AUTO](VC):When a grade 2 or greater card is put into your soul by a card ability, three of your rear-guards get [Power]+5000 until end of turn. A lot going on for it. First skill is basically chance-reliant, although if you have any Flirtatious Succubus handy that you loaded yourself it’s a nice way to get out of some pinches…or just making numbers for normal guarding, as most finishers ought to be so high-powered this is trivial. That ties into the second skill, which basically turns Flirtatious and Gwynn the Ripper into near-staples. The final skill is really the main draw for me aside from the retire: the capacity to make numbers is welcome in a Protect deck. That aside, don’t count on spamming it because Soulcharging that isn’t Flirtatious is still chance-reliant. Flirtatious combined with this plus Doreen the Thruster = big. Solid on its own if you missed Death Anchor first time round but a bit slow without setup.